We interrupt our hiatus to bring you this exchange of correspondences between Mr Fong Hoe Fang and Ms Amy Gay, Director of Communications at the National Library Board (NLB). Mr Fang, a member of the public, had emailed the NLB to enquire about its barring of Mr Vincent Cheng from speaking at the forum organized by the NUS History Society titled, “Singapore’s History: Who Writes The Script”. 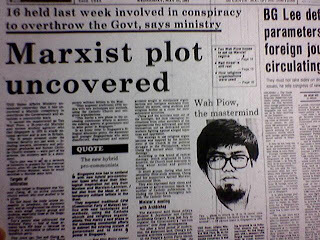 Mr Cheng had been detained under the Internal Security Act in 1987 after being accused of being part of a “Marxist Conspiracy” to topple the Singapore government. I am disturbed by reports that an invited speaker at an NUS History Seminar organized by the NUS History Society for the 4th Jun at the National Library has been barred both from speaking and attending the Seminar by the National Library. The speaker, Vincent Cheng (whom I know personally) was arrested and detained without trial for 3 years in 1987. He was alleged to be one of the leaders of a “Marxist Conspiracy”, an allegation that he never had the opportunity to address in an open trial despite his many expensive and legal efforts to secure such a hearing. Mr Cheng was released 20 years ago on Restriction Orders and subsequently the Restriction Orders were not renewed. I take that to mean that the authorities are satisfied that Mr Cheng has been rehabilitated and to all intents and purposes, should be a free man enjoying all the privileges and performing the duties of a Singaporean. a) Has the National Library taken upon itself, a censorship and regulatory role to bar a free Singapore citizen from participation in a public event which aims to satisfy the public’s underlying curiosity and desire to know more about what happened in a particular situation, a subject, an issue or person? What gives the Library that power to decide on whether a particular topic is suitable for discussion or engagement in public space? Is there an existing list of such topics which should then be made transparent to the public? b) Has the National Library been advised against allowing Mr Cheng to speak or to attend the event? If so, how does this square with the National Library’s principal responsibility to preserve and make accessible the nation’s literary and publishing heritage and intellectual memory? As a concerned citizen wishing to participate in the greater life of our society, I have always believed that public institutions need to vigorously defend their vision and mission which are the compelling reasons for their existence, and on facts of the situation. From time to time, other institutions of government may, indeed must, have different views, agendas or responsibilities and seek to impose these on other institutions for their own purposes. The hallmark of a great democracy is when different institutions are able to fearlessly engage in objective discussion and make decisions based on facts, justice and it’s own designated vision and mission, and not allow these to be hijacked by the goals of another agency, no matter how “good” those intentions may be. My question here is: Were there facts supplied to the Library that caused it to wander from it’s public mission in this case? Did the Library think that it had some firm and objective basis to bar a free Singapore citizen from speaking and attending a public event which was not even it’s own, but one organized by students from the National University of Singapore? The public has a right to know why the Library, of all institutions, has deigned it fit to bar Mr Cheng. More important, I think any free individual has the right to understand why in his own country, he cannot exercise his freedom in a public event at a public venue made possible by taxpayers. The State has freed Mr Cheng. Has the National Library, our bastion of free-flowing information and knowledge now decided to silence him, even after 20 years? The National Library is the venue sponsor for the National University of Singapore’s (NUS) Singapore History seminar organised by the NUS History Society. NLB had supported this seminar due to its focus on the personalities, events and agenda that shaped the history of Singapore . This was in line with NLB’s focus for its heritage programmes and exhibitions which explored the role of key movers in Singapore ‘s growth from a fishing village into a modern nation. NUS History Society (NUSHS) had indicated that Junior College and Upper Secondary students were the target audience and that academics would form the line-up of speakers. The initial line-up provided by the NUSHS for NLB’s support were academics from the local tertiary institutions researching on these areas. The academic exploration that the seminar would pursue was also in line with NLB’s programming objectives to seek insights into Singapore ‘s history through research and study. The late inclusion of Mr Vincent Cheng, by the society was not consistent with the direction of the initial proposed line-up, of academics, by NUSHS. Thank you for your response and the more detailed information you have given below. I hope you will understand that as your reply has been made public to the Straits Times, I will take the liberty to also copy them in this email response to you. Somehow the information does not square with the sequence of events in this whole affair as I understand it, and as it was documented on the Facebook page of the NUS History Society. I say so because as one of the registered attendees, I have been kept updated by the Society via email messages and updates on their Facebook page. Mr Cheng was not a late inclusion because he was invited on 19 May 2010, following which a Facebook update was made on 20 May 2010 at 6.47pm which specifically mentioned “Operation Spectrum? What happened on 21 May 1987? Find out more on 4 June 2010 at the NUS History Seminar 2010 at NLB, The Pod. More details soon”. This was followed by another Facebook update on 23 May and then 24 May where the Society “advertised” the topic by Dr Loh Kah Seng (on the Bukit Merah Fire) and the presence of a Special Guest, Mrs Jean Marshall. I also received an event invitation (see attached) where there were only 3 speakers (A/P Yong Mun Chong, A/P Loh Kah Seng and Mr Cheng as well as Special Guest Jean Marshall). There were no other speakers in this event invitation. I received this invitation via email on 26 May at 1.53am. On 26 May at 8.35pm the History society’s Facebook page had an update that Prof Huang Jianli would be joining the Seminar. Note that this was after I had received my email invitation. So how could Mr Cheng’s inclusion be a late one? Prof Huang came way after him, and now, I have just learned from your email reply below that there is an even later arrival – A/P Kwa Chong Guan. If Mr Cheng was not welcomed to speak at the seminar, shouldn’t he have been told earlier? Especially after the Facebook updates on 20 May had been made? What is a registered participant to think? I hope you do not take this as a reason to take the NUS History Society to task. Indeed, I have every respect for them in managing what must have been a very difficult situation. They are students, flushed with the passion and idealism which we adults have long lost. As a citizen who is highly supportive of the Library and it’s Vision and Mission [I unashamedly owe my education to the Library], I hope it would also stand true to it’s Shared Values, proclaimed so loudly on it’s website, that we share an “underlying curiosity and desire to know more about what happened in a particular situation, a subject, an issue or person.” Do we really? Finally, Mr Cheng had been specifically told that he is not allowed to even attend the seminar as a member of the audience. I am glad you have now said that he is welcome to attend the seminar. The recent incident when the Ministry of Education first invited and then disinvited a teacher speaker from the United States , before quickly admitting it’s mistake, apologising and then graciously inviting her again, is a lesson our public institutions should take a leaf from. I think most citizens have not only “forgiven” the MOE, but have a new respect for them. Surely Mr Cheng deserves nothing less from the NLB?